As a homeowner, there are many improvements you would like to tackle on your own. Doing things yourself is an excellent way to save money on your overall home ownership costs. However, even simple projects, such as painting, may require a helping hand if your safety or the structure of your home could be compromised by mistakes. These are five such tasks to evaluate and then proceed or call a professional. 1. Painting. The simple act of painting a room isn’t difficult and its project that even new homeowners shouldn’t be afraid to tackle under the right circumstances. But there are dangers that must be considered prior to popping open a paint can. True Value Hardware cautions that working around electrical outlets may require turning off the power. Additionally, some interior paints may trigger respiratory issues in those sensitive to volatile organic compounds. Room height is another aspect to consider. If you have vaulted ceilings or must paint in a stairwell, it’s probably best to pay a professional. 2. Roof repair. Your roof is one of the most important components of your home and is its first line of defense against rain, sleet and snow. 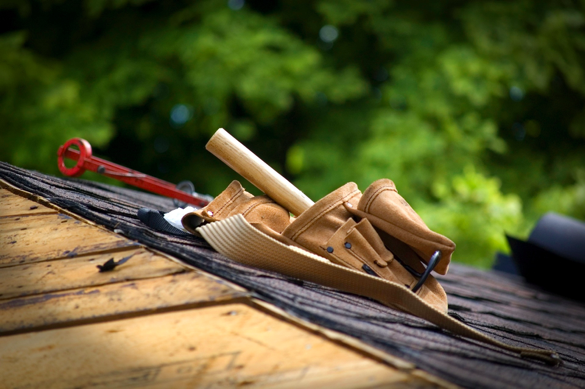 Check your roof once each year for loose or missing shingles. These can easily be replaced. Anything more advanced should be referred to a licensed roof repair contractor. Asphalt roof repairs are typically not that expensive, costing between $269 and $825, according to HomeAdvisor. If the repairs needed are less than your insurance deductible, it makes sense to pay out-of-pocket. However, if the damage is significant, call your insurance company. 3. Deck. Your outdoor recreation is important to your overall quality of life. A deck or patio can increase your living space seasonally and, depending on its location, is a great DIY project for those comfortable with hand tools. Many big-box retailers offer detailed instructions on how to design, layout, and build a professional-quality deck with common materials. . This is not a quick-fix project and multiple days and at least two people working several hours each day before completion. Never attempt to build a second-story deck unless you have extensive carpentry experience. Ground-level projects, however, are a great learning experience. 4. Bathroom remodel. Many minor bathroom-remodeling jobs can be done in a single afternoon and cost less than $100. Installing a new toilet, adding modern cabinet hardware, or replacing a large bathroom mirror can instantly update this important room. Be careful when doing plumbing work, however, as even minor leaks behind the wall can result in significant structural damage and require expensive repairs later down the road. 5. Kitchen cabinets. The kitchen is one of the most used rooms in the home and also one that tends to suffer from quickly changing design trends. Give your kitchen a face-lift by painting the cabinets and adding brushed nickel hinges, knobs and drawer pulls. If your kitchen countertops are less than appealing, a contractor is your best bet for replacement. This requires meticulous calculations in order to properly cut the countertop material to fit correctly around the sink. Porch.com offers more advice on when to tackle this on your own and when to call an experienced contractor. Many minor to mid-grade home improvement projects can significantly increase the value and livability of your property. But, even seemingly simple tasks are not without their risks. Before you begin any improvement or upgrade, first evaluate your safety and the cost of doing it yourself versus calling an expert. There are plenty of projects to go around so rest assured, there will always be something for you even if you have to call the pros for these. This entry was posted in Blog, Uncategorized on March 12, 2018 by James Silver.